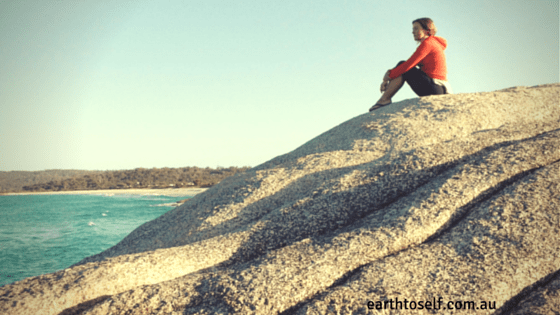 Earth to Self | 10 strategies for navigating inner growth. 03 Jun 10 strategies for navigating inner growth. I’m sure I don’t need to tell you – the path to authentic personal growth and healing is not an easy one. We are tested, challenged and at times brought to our knees (over and over again). But these times can also be the making of us, representing a valuable opportunity to accelerate our spiritual and emotional development. The key? Staying conscious and present to the process. Taking on the challenge fully. It’s easy to intellectually understand this concept – but doing the actual work required is a whole other ballgame. Oh, yes! So I’ve listed below 10 strategies to help you consciously move from meltdown to breakthrough. Can you add anything to the list? Whatever it is you’re feeling, tune in and notice where it is in the body. Emotion holds energy and that energy will be nestled somewhere in your body, gaining intensity. Personally, the best way I know to move this energy up and out, is through dance. But if that’s not your thing, walk, run, do yoga. Whatever you choose to do, connect with the felt sense of this energy in the body and move from the inside, out. Do what ever this sensation needs to help it shift. Breathe. Don’t forget to breathe! 2. KNOW WHEN YOU NEED HELP (AND GET IT). Being willing to get help is the ultimate act of bravery. A key clue to knowing you might need help is when you are struggling to function normally in your everyday life (bonus points if you’re really good at pretending everything is OK). Reiki, massage, therapy, kinesiology. Whatever your choice of healing modality, book yourself a session. Studies have shown that just being in the presence of an empathetic therapist can provide up to 75% of the effectiveness of a session (more than what they actually do). Why? Because your pain, discomfort and upset is shared. Your load is lightened and you feel heard. Often that’s enough to provide some relief and get you moving in the right direction. Got your issue on repeat, swirling round and round your mind. Ugh! That’s enough to drive anyone towards meltdown central. Get a pen, some paper or a journal and literally write it all out. Scribble, yell, scream, give yourself RSI – just get it out of your head and onto paper. The beauty of this is that you’re then less likely to dwell on the same thing AND the next steps or deeper insights surrounding your meltdown could give you something new to work with. I remember years ago, I was in an extremely distressed state and my psychologist gave me homework: everyday at lunchtime, I was to go to a nearby park and just sit there in nature. The vibration of nature is slow, steady, and peaceful and so, just by sitting in nature, my frenetic, distressed energy state was given a chance to attune to the natural and calm rhythms nature. This made it easier for me to cope. Breathe in the fresh air. Feel the elements on your skin. Take your shoes off. Ask for Mother Nature to help you heal and allow her to work her magic. This is a whole post in itself, but let me share some key points. Your medicine for getting through this healing and growth period may well present to you in your dreams. So pay attention to them! Keep a notepad or phone beside your bed to record your dream. Then take time to pay your dream some attention. When writing them out, re-enter the dream and write in the first person – eg. ‘I was walking in a dark forest…’ Trust the feelings and events that arise in the dream and allow them space to reveal their meaning. The key with understanding dreams is the deep resonance you feel in your body when something clicks. Resist the urge to intellectualise and feel instead. Drawing key scenes or symbols can also help. Which brings me to the next point. Sometimes talking or writing about an issue is not enough. Side-step the mind and allow another form of expression to take over. Even if you don’t consider yourself an artist, grab your weapon of choice and simply start making marks on a page. You might like to visualise what you’re feeling and draw that, or create a pattern that represents your state. Whatever it is, it doesn’t have to make sense, just allow yourself to surrender your feeling state to the paper and let it move through you. Afterwards, you may look at the drawing and find a new perspective or amazing insight. For added effectiveness, work with an art therapist. Take a hot bath. Wrap yourself in blankets with a cup of tea or hot chocolate. Go to bed early. Nurture yourself like a mother would nurture a child. You are doing the work and it’s hard! Treat yourself with extra special loving kindness. Brene Brown says that vulnerability is the birthplace of healing. It’s simultaneously frightening and rewarding which is why it’s such an important ingredient for your ultimate growth. Talk with someone you trust. Someone you know who will listen and share your discomfort, not feel sorry for you and over–identify. If you’re feeling brave, keep your eyes and ears open for a women’s gathering or sacred circle. Sharing in circle can be profoundly transformative, not just for you, but also for everyone present. The bright side of an almighty meltdown is that you are well and truly breaking through old patterning to new ways of being. This suffering, if handled completely, will be the source of much healing and growth on an inner and outer level. With this in mind, let yourself really go there. Dig it all up, let it all come out. No use leaving things half done – they’ll only reappear later on. Do this work in a therapeutic setting and your growth will be amplified and accelerated. Also, understanding the map of the Heroic Journey will help place your current struggles into some kind of context. Whether you feel like it or not, you are supported. If there is one thing your can trust at this time, it’s that. The universe, your soul, spirit, they are all working to help you move towards healing and wholeness. Allow yourself to open up to this. Ask for help and then use all your communication faculties to receive guidance. The more you trust the process, surrender to it and stay present, the quicker you’ll be able to move through this time and come out the other side, integrated and whole. Until the next deep dive, at least! Remember: getting help is the bravest thing you can do and can vastly deepen and amplify your growth. Don’t be afraid to reach out. I’d love to hear if you have any strategies that you rely on to consciously move through a difficult time. Share with us below. Hi Saskia! Whoops, your comment must have slipped past as I’ve only just seen this now. Thanks for getting in touch – I’m glad this post was able to help in some small way. Sometimes we just need to try a new approach to get us out of a funk. Pretty sure I did all of these at some point this week! So valuable, even when you’re just feeling a bit down!